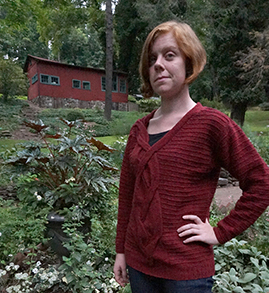 Apriori Knits offers knitting patterns and inspiration to help you persue your handmade life. So, I've been petting my supply of Brooklyn Tweed Loft for a while trying to come up with a new design that would do it justice. I wanted a casual sweater that could be just tossed on, but that also had a distinctive look. I settled on a V-neck with a very large cable twisting up the front. The twist, so to speak, is that the cable doesn't break evenly at the V-neck. A majority of the cable breaks to one side, with a plain band running up the other side. While I really like the finished look getting there was a bit more involved. This cable is very wide, so planning the number of rows between cable crossing took a bit of trail and error. I also wanted the cable to be somewhat random, and not have evenly spaced crossings as in a traditional cable. Once I got that under control I started blithely working my way up the front. About half of the way up I realized that in order for the cable to break properly at the neck that it had to be slightly off center when separating for the neck. So. . . . rrrrip and re-do the charts to have is shift slowly to one side as it travels up the front. On the finished sweater this shift is not evident - it appears as if the cable just goes right up the front - Success! The balance of the sweater has horizontal garter ridges running at even intervals to add a counterbalance to the cable. I also didn't want to knit the rest of the sweater in all stockinette stitch because honestly I get bored knitting plain stockinette stitch! 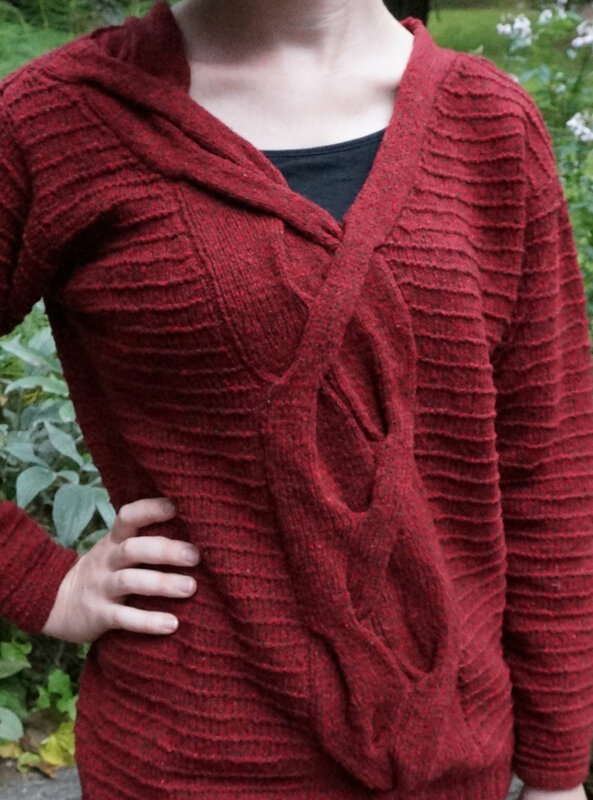 I test drove this design at Rhinebeck Sheep and Wool Festival this year to see if there would be any comments. And, let's face it, at Rhinebeck don't we all comment on other peoples sweaters. Not only did I get a lot of "oh wow - what an interesting cable", but many people correctly identified the wool - "Brooklyn Tweed - Right?" Our newsletter is rather infrequent, so don't worry about getting inundated.